Everyone wants their home to smell nice, and one of my favorite ways to smell up my house in a good way is using candles. Lucky for me, it’s my most favorite time of year…spring! All the floral and berry scented candles are in full force and stocked on the shelves of your fave store. 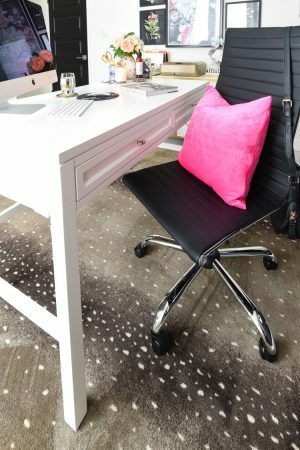 The other thing I love about spring are the bold red, pink and magenta hues in home decor, clothing and accessories. These hues have a bright, bold, playful and light feeling. When I think of “Brightness” I think about the fun times I have with my friends and family where there’s lots of laughter and girly fun. I also think of being more spontaneous and in the moment to live life to its fullest. 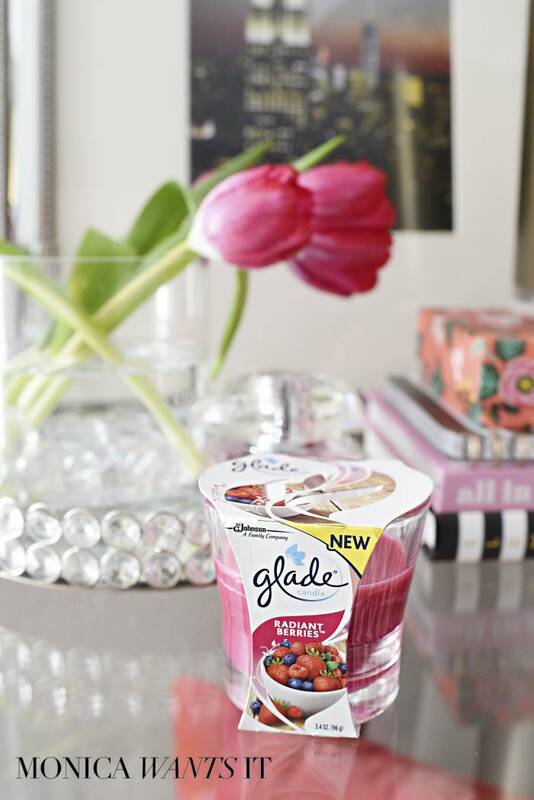 Using those feelings and the new Glade® Radiant Berries™ candles that I bought from Walmart as inspiration, I put together a DIY Floral Arranging Soiree for you today. The party plan includes three recipes, a tasty mocktail recipe, three free printables, and plenty of decor ideas. The bold pink and red hues along with the prominent berry flavors in all the food makes this party a feast for the eyes and tummy. This tasty mixed berry sauce is so easy to whip together and has a wonderful sweet but tart taste. 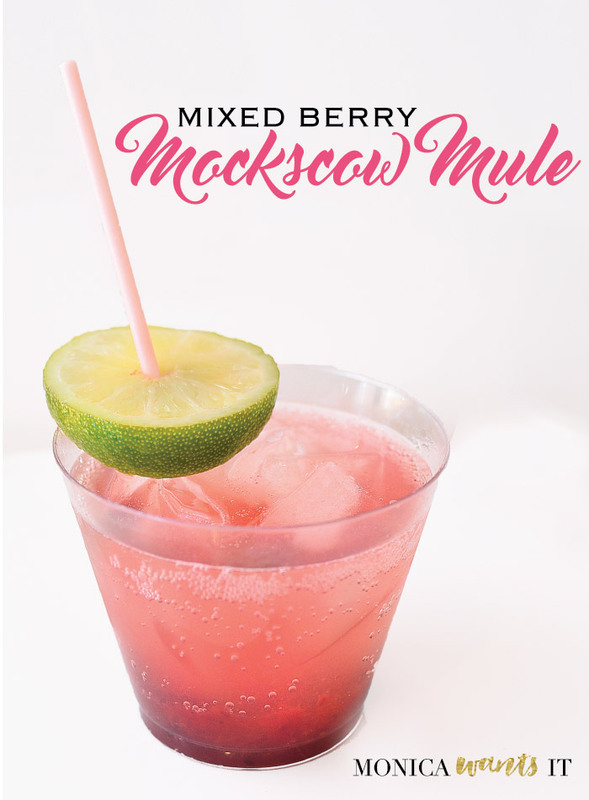 It’ll be used in two of the recipes below: chicken monte cristo and mixed berry “mock”-scow mule. Combine berries, sugar and lemon juice in a sauce pan over medium heat. Stir occasionally breaking down the berries (I left some chunks in my sauce for texture). Continue cooking until berries are soft and juices begin to form in pan. Add in cornstarch, turn up the heat, and stir continuously until the desired thickness is reached. Let the sauce cool slightly before running it through a fine mesh sieve to remove seeds. Store in an airtight container in the fridge for up to 5 days. 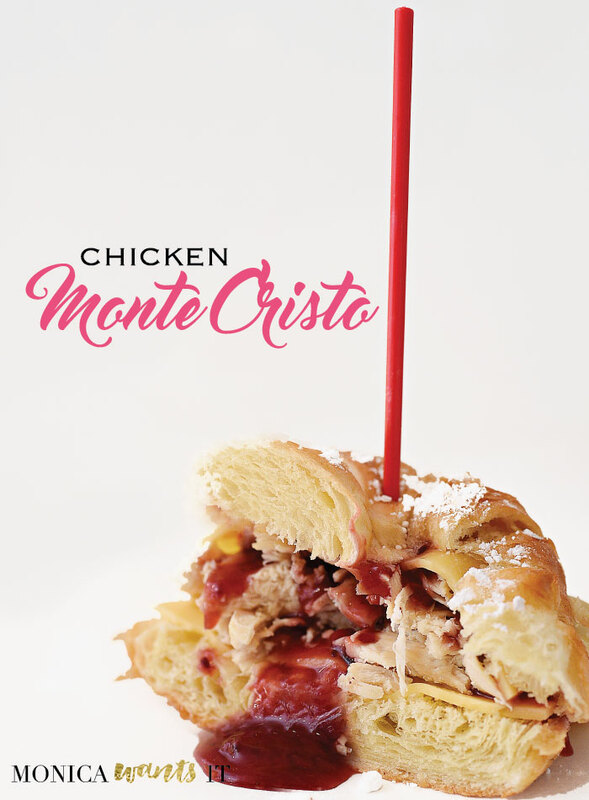 One of my favorite sandwiches is a monte cristo- it’s cheesy, sweet and fried goodness. My version is a little lighter, but just as sweet and tasty. The best part is how easy these are to make. Serve them alongside kettle chips for a sweet and salty meal that is sure to satisfy! Warm up your croissants for about 30-seconds in the microwave. Slice in half. Cut your swiss cheese slice in half and put on each side of the croissant. Put 2 oz. of warm shredded chicken on one side of the croissant. Top with a heaping tablespoon of mixed berry sauce. Put together the sandwich and dust lightly with powdered sugar. One of my favorite drinks is a moscow mule– the ginger and lime are refreshing and a perfect flavor combo for spring. Adding in some of the mixed berry sauce turns this mocktail drink a gorgeous ombre hue and adds yummy flavor. In a pitcher, mix together the lime sparkling water and non-alcoholic ginger beer. As your guests arrive, gather 8 glasses and put one tablespoon of mixed berry sauce on the bottom of the glass. Add ice and pour the lime and ginger mixture over the ice. Garnish with a cocktail stirrer and lime slice. 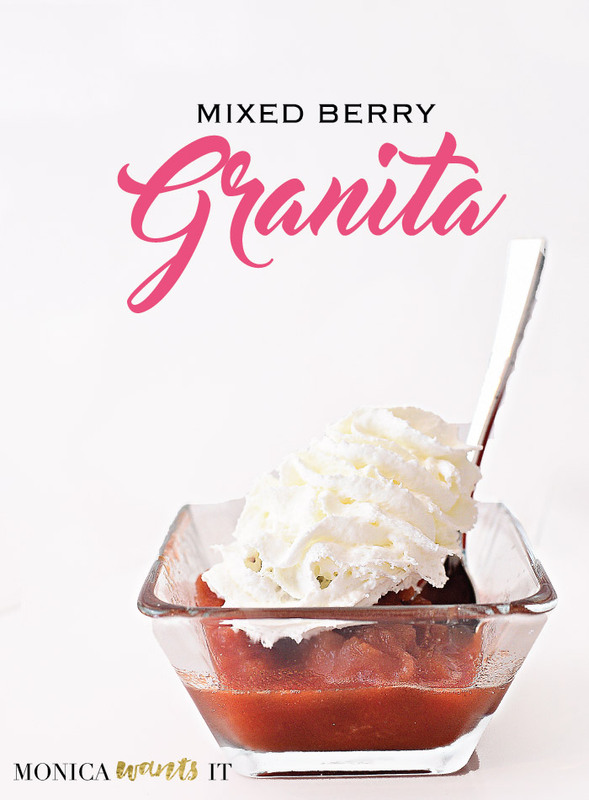 I usually make my granita using the traditional fork raking method, but I wanted a smoother consistency, so this time I ran it through the blender before serving…it’s a slushy delight! In a sauce pan, heat the water and sugar on high/boiling until dissolved. Lower temperature and simmer for 3-5 minutes. Let the sugar syrup cool while you move onto the next step. Puree the raspberries and strawberries in a blender or food processor. Run the mixture through a fine mesh sieve to remove seeds. Add in the lemon juice and sugar syrup to the puree. Mix well. Pour the mixture into a loaf pan and freeze overnight or for at least 3-4 hours. Once you’re ready to serve, let the frozen mixture stand for about 10 minutes and then scoop it into a blender. Pulse it a few times, pour into dessert dishes and top with whipped cream. Now that you have some ideas for tasty, berry inspired food, it’s time to talk theme and decor. 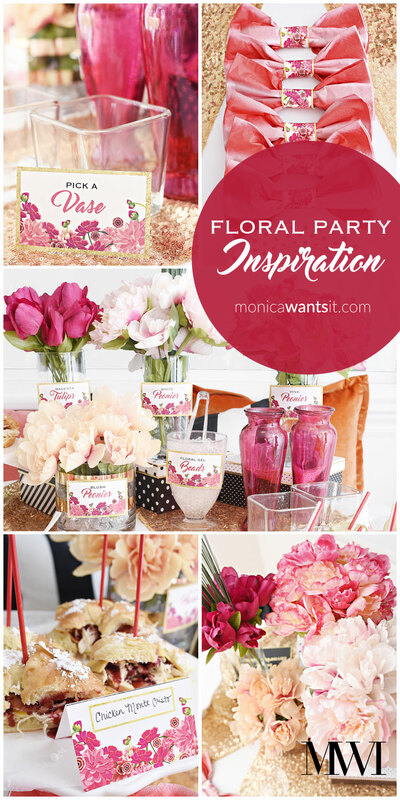 This Latina LOVES themed soirees, so the theme for this party is a DIY floral arranging party. Invite your girlfriends over for some yummy food and then each person can “pick” flowers and a vase to create their own floral arrangement to take home. Girls night in has never been this fun! For a floral arranging party, you can keep costs low by buying faux florals at your local craft store or dollar store. Each bouquet of faux flowers tends to have about 5-7 stems, and I’d recommend buying about 8-10 stems per guest, plus a vase for each guest for their DIY creation. To help expedite things, I cut each of the stems so they are ready for each guest to just pick out of the vase. 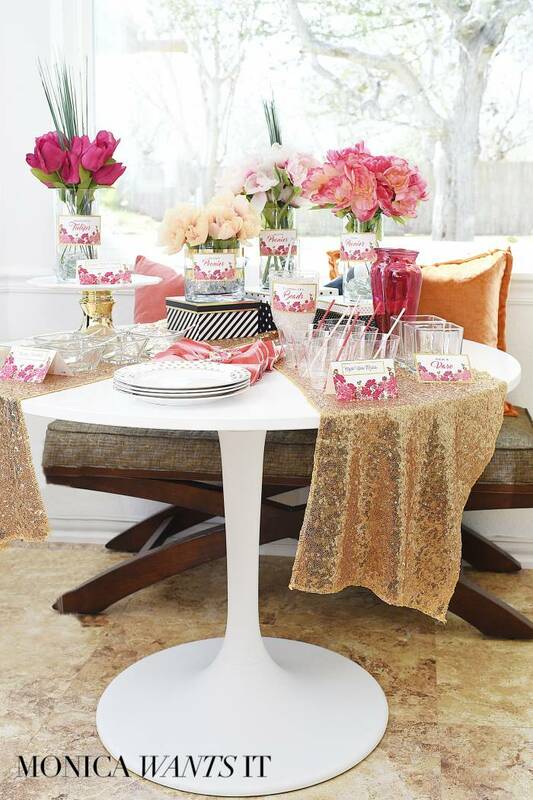 In the meantime, the vases and flowers serve as decor and add vibrant color to the table. In addition to flowers and vases, you might also want to provide some greenery, washi tape, ribbon, paint pens, or water beads/gems/vase filler. 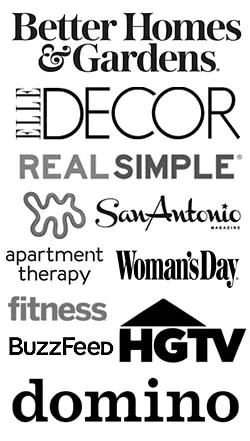 There are so many affordable options, so use what you have and get creative. My fave are water beads because they’re so glam and so affordable, plus they come in a myriad of colors. For the set-up, I love to use the round table I have in my breakfast nook. It’s easy for people to walk around it, and then it frees up my main dining room table for the actual crafting fun. Setting up a party table is all about presentation and height to create interest. 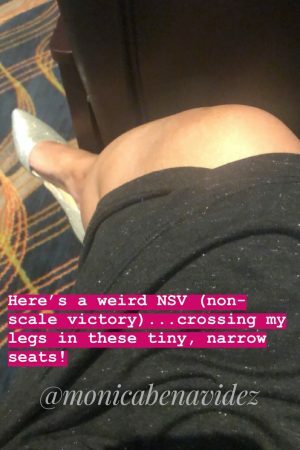 I opted out of using a table cloth, and instead I used an extra long table runner to create a V-pattern on the table to help create “sections”. To create height, I used some decorative boxes under the vases. A cake pedestal holds the tasty chicken monte cristos, and the desserts and drinks are displayed where guests can easily grab them. I even got crafty with the napkins and created a giant bow using rectangular luncheon napkins, paper napkin rings I designed, and some double-sided tape. 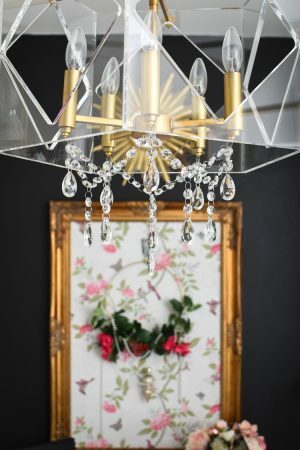 Little touches like this take just a few minutes to put together, but they add so much flair to any gathering. Guests will always remember good food and unique decor ideas! 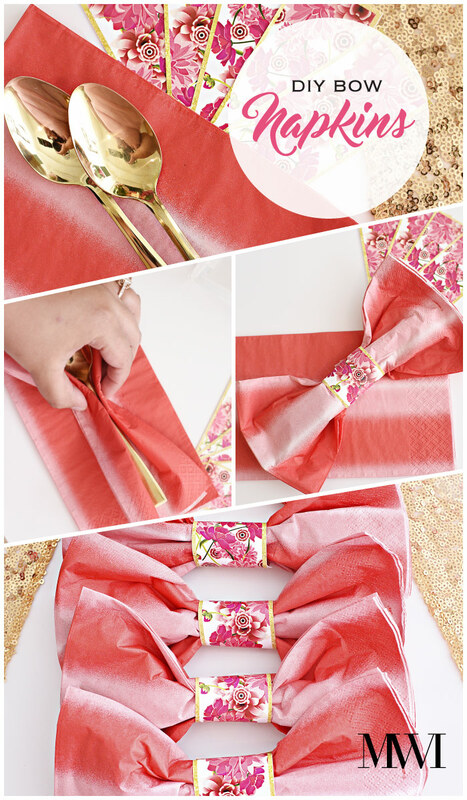 More details about the free napkin ring printable are available towards the end of the post. 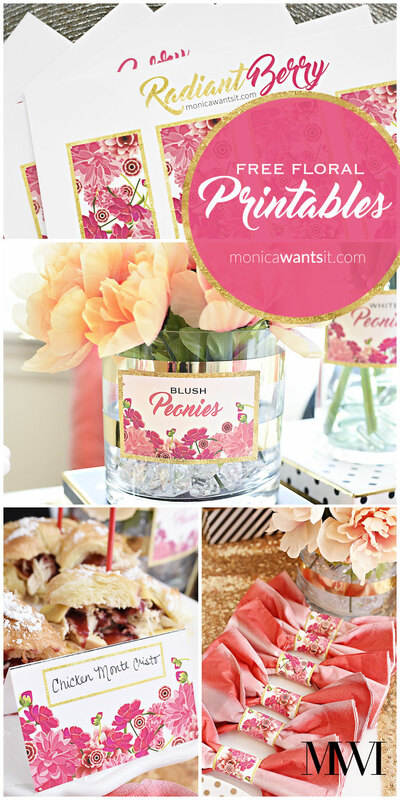 Printables can make any party look chic, and I designed some red, pink and magenta printable decor with faux gold foil accents to complement your next girly gathering. On one sheet I have napkin rings and menu/placecards and on the other sheet I have larger label cards like the ones I used on the vases. There are so many other wonderful DIY and recipe ideas that bloggers have shared over on the Siente Glade portal that you must check out. You can also connect on social media: Glade Latino Facebook, Glade Twitter, and Glade Facebook. Please pin and share this post to help spread the berry pink love! xo. Thank you, Jamala! Your comments are always so nice- I am so thankful to have you as a reader. Glad you enjoyed the post.